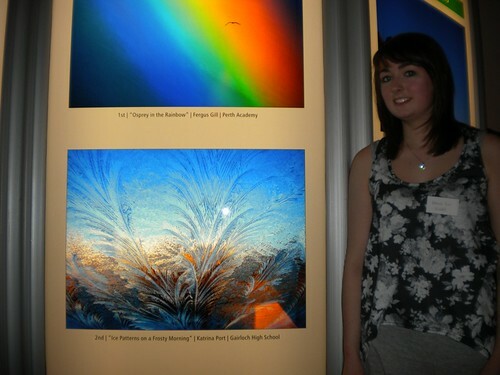 Katrina Port, S5, received her prize of £150 at Dynamic Earth on Wednesday 16th December. She was also presented with a framed print of her entry which gained 2nd prize in the 15-18 category Nature’s Moods. This will be on display in the school entrance. Sponsored by Chevron and open to all secondary pupils in Scotland this competition is judged blind – which means none of the judges know who the photographers are until the winning shots are chosen. Last year Katrina received a Commendation for her entry. Click here to see the competition website and view some of the other entries. Click here to see more photos of Katrina’s photography successes. School Calendar 2010 – Now available for sale from the school. £5 only for a copy of the Art calendar that will brighten up your year! All proceeds go to school funds. Examples of artwork here. You can also look at examples from previous years here. S5/6 Prelims – Pupils in S5/6 have been working with their teachers preparing and planning for their exams, which start at the end of January. Parents should be aware that these pupils should now be focused on these exams. They have been given appropriate materials for their subjects and advised about the steps they need to take to achieve their best grades. The booklet ‘Information and Study Advice for Pupils and Parents’ was issued prior to Prelims in S4 and remains relevant to these exams. It is also available on the school website along with other resources to help pupils make the best use of their study time. We would ask that parents support pupils in preparation for these important exams. Former Pupil Success – We received word that Chloe Ross, Diabaig, has received her Master of Letters (along with a commendation) in Modern Historical Studies from Aberdeen University and is now progressing towards her PhD. Congratulations Chloe! We have also heard that Steven MacKay, Inverasdale, won the Morrison Construction Services Limited Rosebowl Award for the Best Overall Carpentry and Joinery Apprentice at the Inverness College recently at the UHI Prizegiving Ceremony in Eden Court Theatre. Steven’s talent was also recognized in May of this year when he was runner-up in the Skillbuild 2009 Scottish Joinery competition, held at South Lanarkshire College – Well done Steven! Colin Morrison earned his Green Beret at a Royal Marine Graduation Ceremony on 28th October. Colin is serving with 45 Commando based in Arbroath and is currently training in advanced driving skills. Over the next few months he will be training in Artic Warfare in either Canada or Norway. Acquiring a green beret is difficult, rare and a major success! Well done Colin! 832 Squadron – Congratulations to the efforts of ATC staff and the pupils involved with the ATC. On 1st December, 2405 Detached Flight gained independence and status by gaining squadron status. FairTrade – Mr Sutherland organised a small, low-key charity event at the High School to re-launch Traidcraft working with a group of S3, S5 and S6 pupils. The evening raised £82.40. Special thanks to the following pupils: Megan Crueize handled her duties at the door very well while Kim Lister & Kate Macleod took on the responsibility of the sale of Traidcraft confectionery, packets of tea, cards and gift packs. Lewis Martin & Amy French provided a welcome cup of tea or coffee to all our visitors while Ross Macdonald, Conal McDonagh & Alasdair Paul provided excellent ceilidh music. Andy the Jannie, Miss Hunter and kitchen staff should also be thanked for providing all of the important background help that is so often overlooked. Bottle Bingo – On Saturday 28th November the Parent Council held a Bottle Bingo event in the school. The evening, which included a raffle, tea and cakes as well as the bingo games, was a success raising over £520. Thanks to Christine Rae for calling the numbers and everyone else who contributed! St Andrew’s Day – An assembly was held on 30th November to acknowledge the end of Scotland’s Year of Homecoming. After hearing about Scotland’s patron saint, everyone was reminded of what has taken place over the year at Gairloch High School under the Homecoming banner of “culture and heritage”: Debating success in Gaelic and English, Scottish Opera’s “A Tale o’ Tam”, the “Their Past…Your Future” project in Gaelic, visits by singer Ishbel MacAskill and writer Angus Peter Campbell, participation in the local Mod, and the main Homecoming Event in March – S1, 2 and 3’s celebration of Rabbie Burns, with support from Eden Court’s Islay MacRae. The latest project is S1’s “Gothic Gairloch” project, which will continue in the weeks and months to come. Link School in Malawi – Over the past year, money has been raised to provide materials for basic repairs to classrooms at our partner school – things like doors, windows and cupboards. Many different people have contributed, and we are grateful to all of them. In particular, Roxanne Ramsay has raised over £400. Two recent fund-raising events have taken place: On Friday 27th November, the Rockvilla Hotel in Lochcarron held a very enjoyable quiz night, which raised £160, and on Monday 30th November, a non-uniform “tartan” day at school raised £222. Thank you to all those involved in organising these events and to everyone who contributed. We now have almost £1800 and this will be sent off to Malawi shortly. Fèis Rois – A representative from the organization met with staff and the Parent council to discuss improving provision for pupils in the area. It is hoped that classes will be started after Christmas on a Thursday after school. Details will be published once arrangements are confirmed. Carols from Scratch – On Friday 18th December, the school will be having a Christmas Concert with a difference. Many adults in the community have said how much they enjoy singing Christmas songs, and here’s the opportunity they have all been waiting for! At 6pm the school will be open to any members of the community (young and not so young!) who would like to learn some carols and songs to sing with the children later. There are 6 carols in all, and we will practise them from 6pm onwards. Then, at 7.30pm the concert will start. Don’t worry – no musical talent is required; just bring along your enthusiasm for Christmas music, and we’ll do the rest. We look forward to seeing you all there! Northern Lights – If you are buying online don’t forget to go via the Northern Lights website. All the local schools benefit from this and it doesn’t cost you a thing. 11th Jan 2010 – School re-opens. Merry Christmas and a Happy New Year from all the staff and pupils of Gairloch High School!